"The Gathering" & "In The Beginning"
The fan consensus on this two-feature DVD is that it represents the Worst and Best of Babylon 5. To be fair, “The Gathering” as a pilot episode is merely mediocre. Pilot episodes are seldom the strongest of a series. The launching of Babylon 5 had a heavy burden to carry. When Deep Space Nine appeared – or Voyager for that matter – the Star Trek universe was pretty well known. Only the characters and specific situation required introduction. Yet, in “Gathering,” the entire Babylon 5 universe required introduction. On this DVD, “The Gathering” is a Director’s Version. Scenes have been added or clipped, and the sound score has been re-mixed, making a superior overall product. My main complaint with "The Gathering" is that it’s quite unnecessary. One can never watch the pilot, and still understand the series perfectly. It’s almost better to NOT watch it. There were so many cast changes between the pilot and the series, so many costume, prop, and make-up alterations… watching “The Gathering” can be a little unsettling. Perhaps it may be heresy, but I would suggest “In The Beginning” as a better introduction to the series. 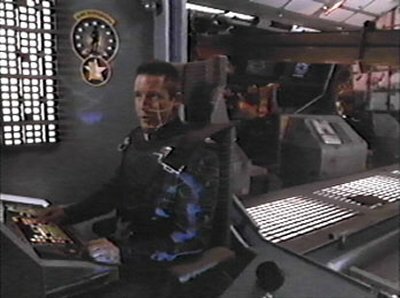 Filmed during the last season of Babylon 5, this tele-movie recreates the events leading up to the Babylon 5 program. Humans encounter an alien first-contact situation that goes horribly wrong. A war breaks out between the humans and the highly advanced Minbari, a war the humans cannot win. The Vorlon ambassador is nearly killed by an assassin shortly after arriving at the station, and Commander Sinclair is the prime suspect.